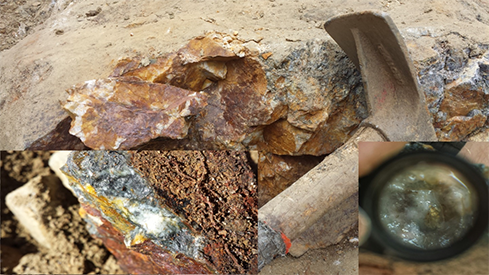 Vancouver, British Columbia – September 20, 2018 – GGX Gold Corp. (TSX-v: GGX), (OTCQB: GGXXF), (FRA: 3SR2) (the “Company” or “GGX”) is pleased to announce it has discovered an extension of the Gold Drop Vein System south of underground workings on its Gold Drop property near Greenwood, B.C. The vein extension was discovered by the Company through a combination of a 2017 soil geochemical survey and follow-up trenching during the 2018 summer exploration program. 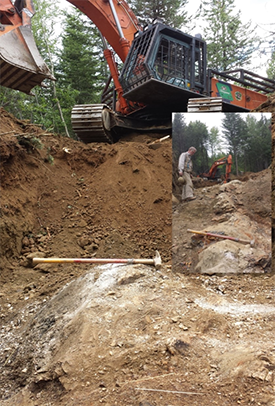 A quartz vein was exposed over a 20 meter length in a 2018 trench south of the Gold Drop underground workings. 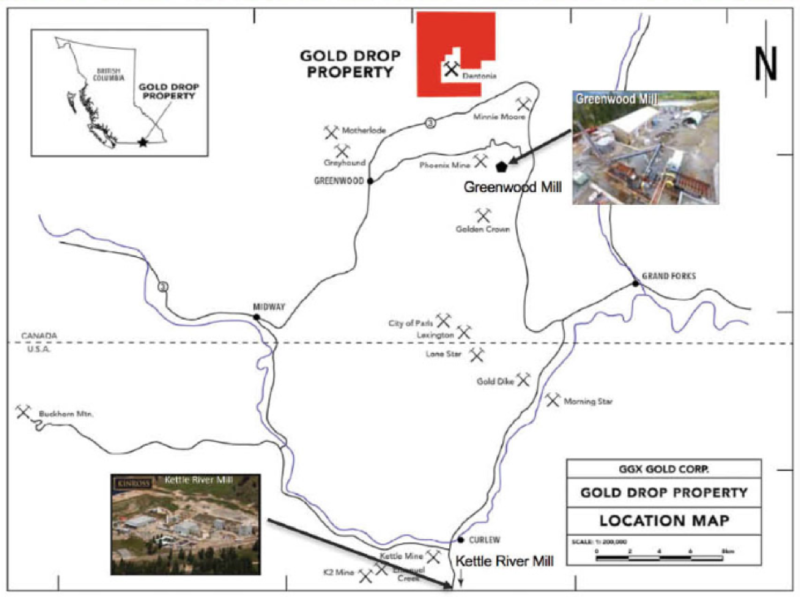 Historic production from the Gold Drop Vein System is reported to be 335 tonnes mined during 1926-1988 (mainly during 1933-1941) with 5,020 grams of gold (14.99 g/t gold) and 35,894 grams of silver (107.1 g/t silver) recovered. 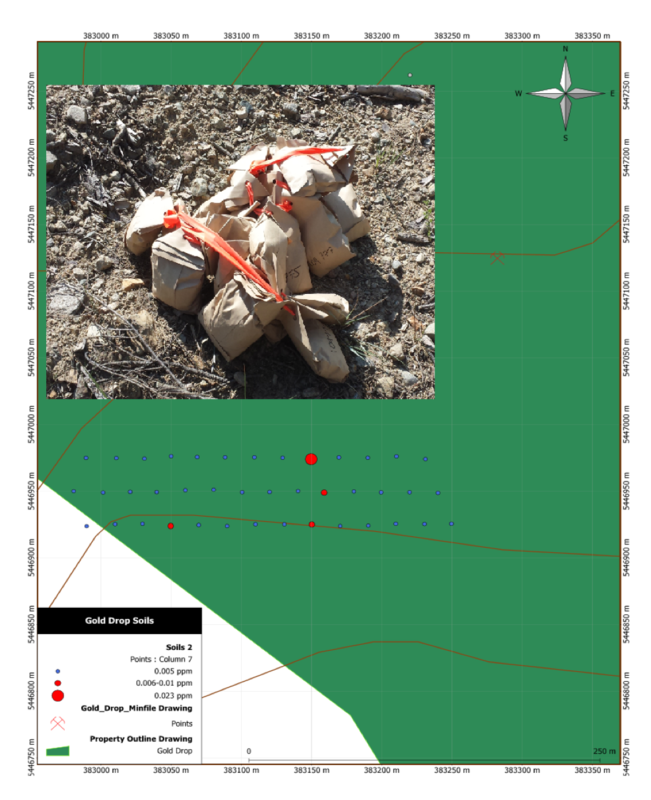 The Gold Drop Vein System, located in the east region of the property, had been previously traced in underground workings for a strike length of approximately 160 meters. It was explored and developed underground through drifts, shafts and two adits. The area south of the Gold Drop Vein has seen historical exploration through numerous pits and hand trenches. Historical exploration failed to locate the southern extension of the Gold Drop Vein System. In 2017 the Company conducted a small soil geochemical sampling program south of the Gold Drop underground workings. The program consisted of three short east-west soil lines spaced 25 apart with staggered 20 meter sample intervals. A distinct linear gold anomaly was identified being approximately 50 meters long, trending approximately north-south and being approximately 50-100 meters south of the Gold Drop underground workings. A trench was excavated during the 2018 summer exploration program across the anomaly. The trench successfully located a quartz vein. The quartz vein has so far been traced for 20 meters. The vein pinches and swells within the trench exposure with measured widths of approximately 0.6 meters to approximately 2 meters. The vein trends approximately north-south. The vein was observed to be sporadically mineralized with pyrite, chalcopyrite and trace amounts of galena. Company management is very excited by this new discovery. Channel sampling and further trenching are planned for this area.